Birth can be very unpredictable. 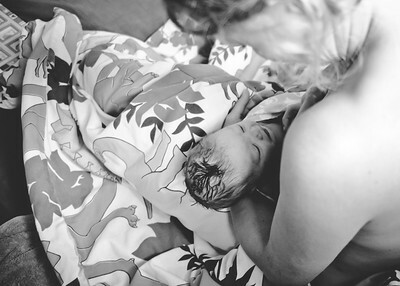 Birth Photography is difficult to schedule, as babies tend to arrive in their own time. Such was the case with little Leonie. After being photographing her mom labour beautifully for several hours in the wee hours of the night, baby decided to give everyone a chance to rest and sleep a bit. The next day, once labour began anew, it was fast and furious. Even though I was called about 2 minutes after the waters broken, and I arrived only nine minutes later... I missed the birth by less than three minutes. However, I was there to document the reactions of dad and big brother and sister... when they arrived home to find their new baby sister already cuddling with mom in bed! Although the family missed the birth, mom was support by both a doula friend, and a midwife from the Maison de Naissance here in Gatineau. Ottawa and Gatineau area storytelling photographer, specializing in birth photography and hospital sessions.